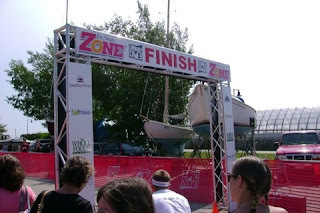 Wow, what a fun race the Urban/EPIC was! I wasn't feeling that nervous for the race and slept very soundly. I got up at 5am ate breakfast... this time cereal, banana with peanut butter, toast with homemade strawberry jam and earl grey tea. No orange juice on the advice of Ange who thinks the acid may have caused my leg cramps in the Peaks to Portland swim. My brother picked me up and we arrived at transition at about 5:50. I had dropped his chain the night before when I racked his bike so he had fixed that and went out for a warm up. 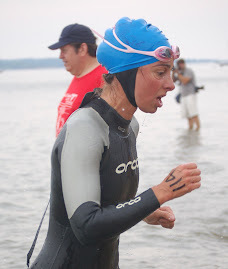 There isn't much for a swimmer to do pre-race so I just chatted with people I knew and started sipping my HEED, which I did mix properly this time. By 6:15 Mary and Andy (my runner) showed up and the transition area was hopping. Interesting to see some of the elite female athletes -- they were svelte, muscular and tall. I was deinfately releived that I was not swimming in the same wave as them, although it would have been fun to get so utterly crushed. It was clear. Then the fog rolled in. We couldn't see the ocean! I stashed some extra fuel just in case the start was delayed. I caught the second to last shuttle to Mackworth with Mary and Claire. Ange was already there. Mucho fog as we crossed the bridge with very little water visible. Yikes! What would they do? We arrived, unloaded and waited in line for the potty. The race staff said they were going ahead as if there was no fog and would delay the race only if it remained at the race start. Now I was getting nervous. I had been mostly caught up in being a Tri groupie and listening to all my Tri friends talk about the course challenges etc. Now the reality that I was swimming too set in. Saw John, my friendly competition from P2P. We all headed down to the beach and over to the left side for the pre-race talk by the director. 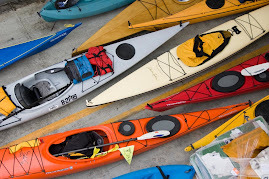 They had set out many more buoys than last year -- thankfully! 2 orange, 2 yellow, 2 orange and then 2 orange on the beach. He said to head for the first set of orange and go through them. Ange had warmed up and said the current was very strong. Hmmm... As I watched the elite wave line up in the chute I was nervous and excited for Ange. What a group this was. A female pro headed to Beijing, 2 very fast amateurs and 3 very speedy Maine women. As they took off it was quickly aparent that something was very wrong. They were headed on a sharp left tangent AWAY from the orange buoys. The current was that strong. It seemed that the group only realized this about a minute into the race, seemingly not that long, but way off course. They now struggled to swim back to the orange buoys against the current. This surely delayed them easily by 4-5 minutes. It was awful to imagine how hard they were working to correct the initial misjudgement. Instead of swimming south towards Portland and the beach, they were all swimming north to get through the orange buoys. The race director announced that the course was changing. All subsequent waves no longer had to swim through the first set of orange buoys. John and I watched the next three waves struggle similarily to head towards the orange buoys, let alone swim through them. He said he thought we should swim to the right and keep correcting ourselves that way as this may be the only way to get close to the orange buoys and "ride" the current to the beach, instead of swimming against it. Well others strategies did not seem to be working, so I followed John's suggestion. As our wave of Relays, Athenas, Clydesdales and 45-49 year old men took off, I headed west and to the right. Everytime I sighted I saw that the current had pushed me south. I kept recorrectly to the northwest. This worked! I ended up very close to the orange buoys and decided this was good enough and let the current "push" me towards the yellow buoys, however I still had to keep over-correcting towards the north and Tukey's Bridge. This also seemed to work and I easily passed throught the yellow buoys. As I did I saw a steady line of light blue and red caps swimming north and just around the left yellow buoy. I felt for them! From here it was a steady strong swim to the beach. My arms felt heavy, not from swimming so hard. I think it was mostly residual muscle fatigue from Peaks. I didn't push too hard. I thought about how fresh the water smelled. How warm the sun was. How the top 4 inches of water was actually somewhat warm and below that refreshingly cold. This IS SUMMER and I am doing something I LOVE. How cool is that? I guess John was on my left at this point but I didn't see him since I was breathing mostly to my right. I started passing lots of people now. Kind of the opposite of most races where I pass lots of people at the start and then it thins out. Red caps, blue caps, green caps, even one white cap! People looked tired. The last set of orange buoys were not in sight but I knew from last year and from a practice swim 2 weeks ago that the stone pier was what I should aim for. The finish line would be right around the corner. However I was still nervous that maybe I was wrong. I could see tons of people on the beach. Head for the people! About half way through the boat moorings I started to pick up speed. Not a full sprint like usual since I felt a bit lethargic, but I reminded myself that every relay swimmer I passed now was one less my team had to pass on the bike or run. I pushed hard. I rounded the pier and saw people cheering. I saw the beach and let go. This was it!! 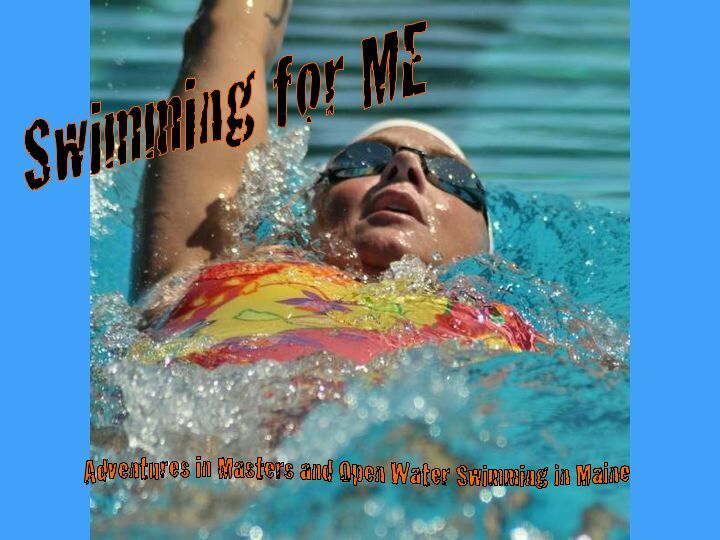 I swam as far as possible til I could almost touch the bottom, stood up and slogged through the water. Running was soooo much harder! I heard my name yelled once and again and again! That was nice. I hustled up to the mini-transition area and Andy was waiting. He calmed took the chip off my leg as I panted and heaved and woobled. Off he went! 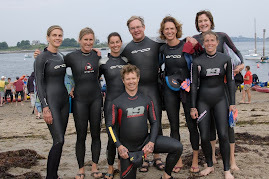 Most of the swimmers I knew had already passed through.... Ange, Katie, Mary, Claire.. I waited a bit and saw a few more ... Stacy, Carrie, Eric, Brent. Great job! I showered, changed and headed to transition to find Andy as he waited for Lorenzo to come back from the bike. We were rocking! Lorenzo came in and it seemed we might be in 2nd place overall. Andy is fast so I knew we had a good chance. I went to the finish line with Lorenzo and we watched as the elites came in. Ange was 5th woman (among them 3 pros!) and she looked great coming acorss the line -- how impressive! (for more go to Ange's Drive to Tri). Andy crossed soon after. By his estimation we might be 1st! We saw Mary cross and she looked really good too, right on the heels of some of her top age group competitors (for more see IronMatron). As they posted the results we saw he was right. We even beat all of the all male teams. Go Team Triple Threat! This will be a must do race for 2009! Ohh! look at the eye candy in the middle of that pic! Is he married, or what? He must have a super Hawt wife. Great job yesterday! No one even came close to beating you guys. You are an unstoppable. I can't wait to see you crush the CEO competition or whatever that was at CELT. You guys are a Triple Threat!! You're the team to beat for sure! Amazing. GREAT Job Alina!! Can't wait to do more with you guys! !